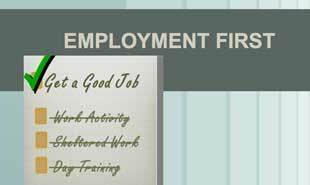 How to make community employment the primary expected goal for working-age adults with disabilities. This presentation covers key elements needed to support Employment First, from agency-level restructuring to policy, funding incentives, and technical capacity. Downloadable note-taking pages. Employment First refers to having community employment be the primary expected goal for working-age adults with disabilities in government-funded day services, and for those services to support that realization of that goal. It is currently being embraced in many US States as a policy initiative.